Papaya enzymes, which are extracted from the fruit, are used for a variety of natural health treatments. Most notably, the enzyme papain is known for its ability to aid digestion and settle upset stomachs. Symptoms of impaired digestion include stomach upset, heartburn and gas, which can cause significant discomfort. Taking papaya enzymes can be used to help your body digest foods that might otherwise cause problems such as gas. Always speak with your physician before using any dietary supplement. See your doctor to discuss trying papaya enzymes to treat gas. Even though enzymes are a naturally occurring substance, they may interfere with medications such as warfarin, according to Health Square. Additionally, if you are using other prescription, over-the-counter or natural remedies to treat other conditions, ask your doctor if there are any potential risks for interactions or impairment of their effectiveness. If possible, bring the nutritional information label with you for the product you intend to use. Generally, you can find the nutritional information by visiting the manufacturer's website. Take papaya enzymes according to manufacturer's directions when you first notice symptoms of gas. Adding the enzymes to your digestive system can help increase the ability to break food down and move it out of the stomach. This can help decrease the severity and duration of the discomfort associated with excess gas. Using papaya enzymes to treat your gas may also help increase the amount of nutrients your body can extract from the foods you eat by enhancing the effectiveness of digestion. 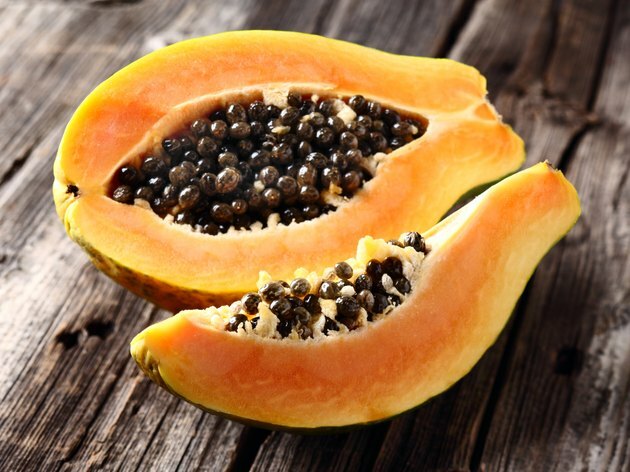 Use papaya enzymes regularly according to manufacturer's directions in order to prevent the onset of excess gas. Some individuals with food allergies or intolerances experience excess gas as a result. The onset may be unpredictable, especially if the offending food or beverage has not been identified and eliminated from your diet. Supplementing your digestive system with papaya enzymes may help increase your ability to break down foods that might otherwise cause discomfort. Monitor yourself for any adverse reactions to papaya enzymes. Side effects of taking papaya enzymes tend to be rare, however, some individuals may experience stomach upset, heartburn, nausea and significant fatigue, especially at high dosages. If you experience symptoms of an allergic reaction, such as difficulty breathing, hives or skin redness, stop taking the enzymes and contact your doctor. Dietary supplements should always be taken under a doctor's supervision. Does Ginger Ale Get Rid of Stomach Gas?